All offers listed here are at discounted prices compared to the single products. Weekly – New Addition, Shattered Throne ! Opening September 4th is the next Destiny 2 DLC – Forsaken. 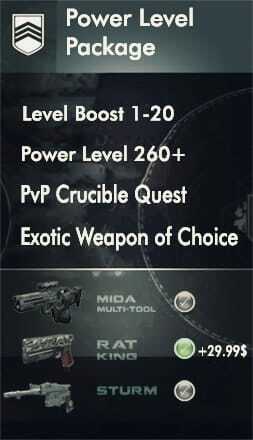 Although Bungie changed how the milestones work they also introduced new power level ceiling (gear level 600). Order full campaign completion, or let us handle all the weekly & daily milestones for you. All in one package, gear up fast and make sure you are ready for the new raid opening September 14th. 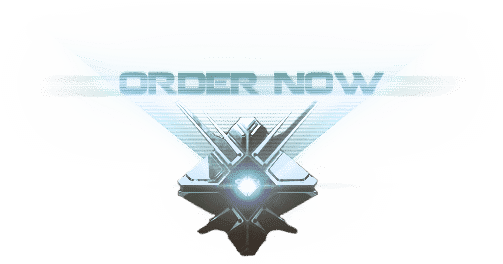 Order now and hit power level 380+ in addition to full campaign completion (if your character is not 330 talk to us on live chat we will make custom order). 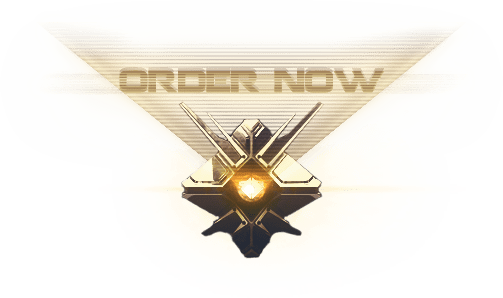 Once finished with this service your character will be able to participate in the new Escalation Protocol event (require power level 375+) and the new raid lair Spire of Stars. Every valuable weapon/armor is kept on your account, tokens, exotic engrams and everything else that comes with the leveling ! The first Destiny 2 Expansion: Curse of Osiris launches Decemeber 5th, and Bungie is introducing new end game content. With the power level cap increased from 305 to 330 and a new level cap of 25, Bungie is introducing the “Masterwork” tier end game gear. Order your Curse of Osiris power level boost now and get everything the expansions has to offer ! As part of Destiny 2 Boosts Nightfall Strikes are now available for order. Slay everything in your path until you reach the final boss and get the reward ! 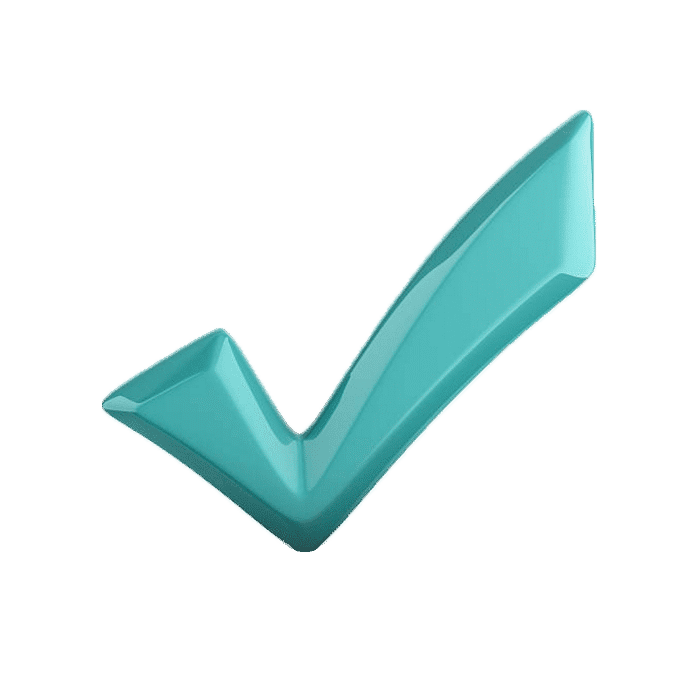 Although some of the lower level strikes are completed while doing the main campaign, you can always go back and try to finish them at harder difficulty for better rewards. All 6 strikes are available for purchase in our Destiny 2 Power Leveling section. For this opening week we are offering The Arms Dealer Nightfall Strike, and rest assured more are to come ! 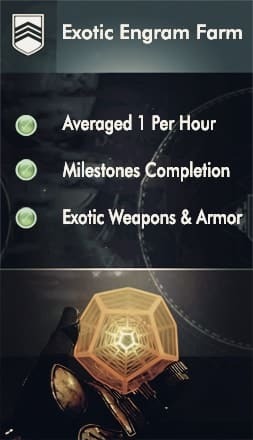 Although only two pices of your gear can be exotic ( weapon and one armor pice) you can still fill out the rest of the gear with legendary items. Going through the missions and completing the campaign is one way to do it. On titan you get your first exotic item from Sloan by completing the riptide mission. All Destiny 2 Exotic items available for purchase in our shop ! Bellow you will find custom orders on demand. 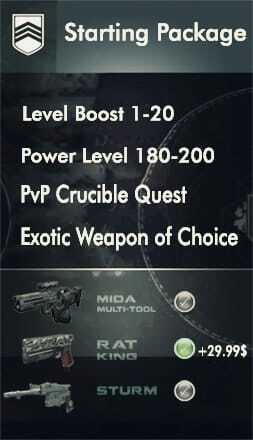 1-20 Boost, 260 Power Level boost and Exotic weapons of choice included. Premade packages specifically tailored for starting a new class, or taking your already existing character to the next level. Also available is Exotic engram farm by the hour – random exotic item drops ! 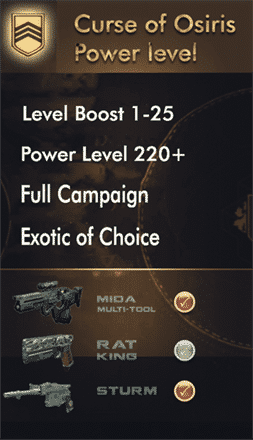 Get Boosted to level 20 and pick an exotic weapon of choice ! 1-20 takes no more than 5-6 hours to complete. Free PvP crucible quest completed to get you on track in no time ! Order now and get quick 1-25 level boost increase. Boost is done in about a day, requires account sharing and Curse of Osiris DLC. 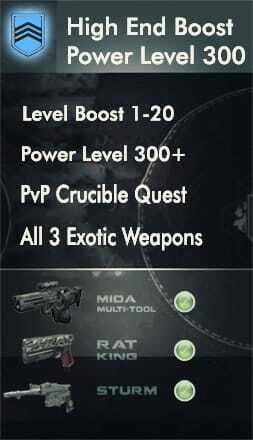 Level 1-25 includes gear upgrades, exotic weapon of choice ( Mida, Sturm or Rat King), campaign completion and raid unlocked. Everything that starting package offers and more ! Finish the campaign story, power level boost to 260, better equipped gear and ready to start raiding ! Hire a booster per hour. We will do every event available in the game, including the weekly resets. Although we average about 1 engram per hour, exotic engram farm can be quite random. High End Power Level 300 boost. 1-30 Leveling and all 3 Exotic items included in this package. Boost might take more than 1 week reset as we will need all the weekly resets at least twice in order to hit the mark. From any level to any level, simply pick starting and desired power level ! 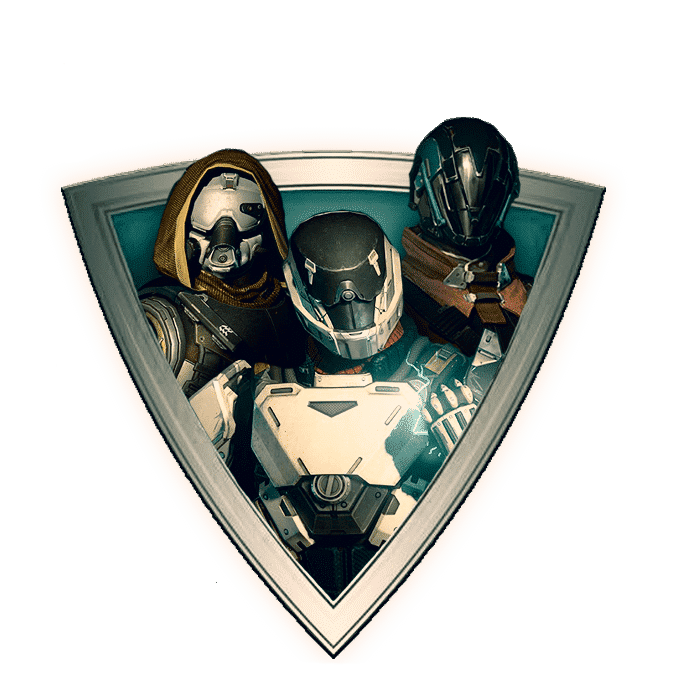 Three years Destiny Veterans. We are professional boosters that do this for a living ! Always order from people that know what they are doing ! 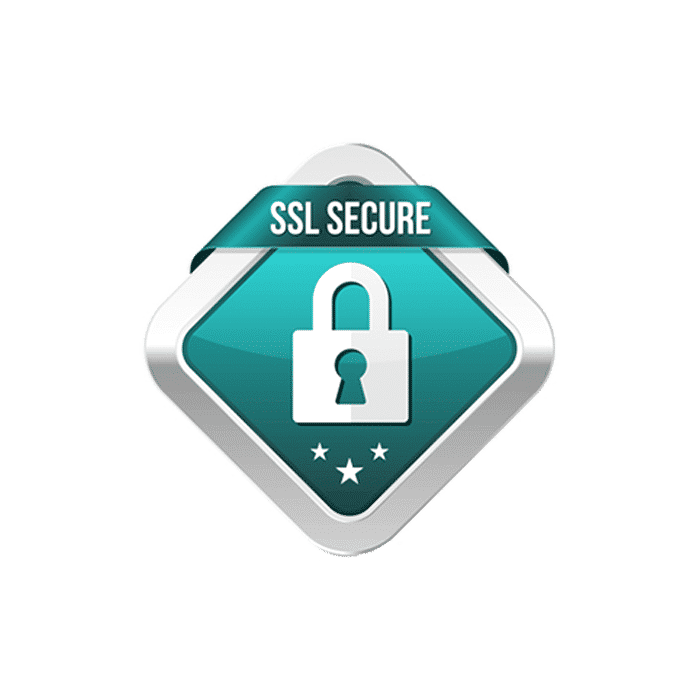 Website uses latest ssl security protocols. All info provided is as safe as it can be ! Live Chat Support ! Got a problem with an order, or have additional questions to ask ? We are here ! Destiny 2 is a First Person Shooter developed by Bungie. For any questions or additional info use the contact/support page. Legit, ordered the power level package + 7-0 trials, was already 260 to start with so they gave me discount. support is top notch, they know what they are doing you can tell from 5 minutes talk.